Hello there, PokeBeach readers! My name is Isaiah Williams and I am excited to be providing content for such a wonderful audience. Ever since I first started the game back in 2010, I have used PokeBeach for their news and articles, so it is a huge honor to now provide articles to you all! For those of you who do not know me, my full name is Byron Isaiah-Keith Williams. I am currently ranked 7th in North America, and I hope to maintain that position with continued success throughout the year. When I am approaching the game of Pokemon, I strive to play in terms of absolutes. Often, decks are based off of hitting certain pieces at certain points in the game and relying on “luck of the draw.” An experienced player will do whatever they can to increase their odds of hitting Beast Ring when they need to use Blacephalon-GX‘s Mind Blown for a KO; but there will be times where they play Cynthia, and there is a percentage chance that they miss. Because of my desire to play in absolutes, I have built a reputation of playing control-based Zoroark-GX decks. Zoroark-GX naturally allows me to see more cards than my opponent over the course of a game. In the control versions specifically, we can slow the game down to where we have enough turns to access our deck while our opponent accesses little of it. At this point, it is not about hitting the cards you need, but it’s about figuring out the contents of your opponent’s deck and removing the pieces crucial for them to win the game. We no longer have to rely on our deck giving us the cards we need at the right time, but only on figuring out how to make sure our opponent’s deck can never give them the cards they need. Using Persian‘s Make ‘Em Pay gives this deck the pressure that control variants have been missing in our Standard meta. 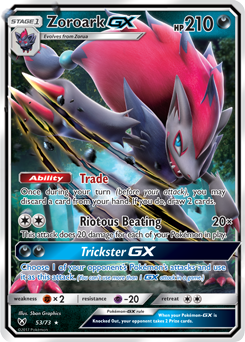 Before, a common strategy against control decks was to pass and build a hand until one could OHKO a Zoroark-GX. From there, one could do this three times to take all six Prize cards. Decks like Zoroark-GX and Blacephalon-GX frequently pulled this off. Now, however, an opponent will get punished for attempting this strategy. 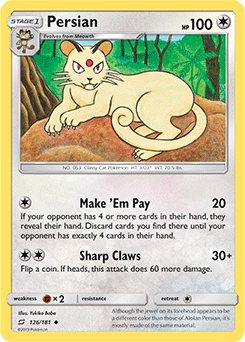 If you notice that they are passing and building a hand, bench a Meowth against them. Around 99% of the time, this will force your opponent to try and play out cards to get what they need. From there you apply pressure without even using Persian. You can also use Persian to snipe specific cards out of your opponent’s hand that you know are crucial to the matchup. At most points of the game, you have good knowledge on the content of your opponent’s hand from repeated Team Skull Grunt. If you notice that your opponent has two Switch in their six card hand then you can go ahead and remove those threats to your lock strategy.